Recently Spain announced that it is increasing the country’s taxation rate on total bank account deposits to 0.03 percent. New revenues from the tax will be distributed to each of Spain’s 17 regional governments to help them pay for budget shortfalls, which the federal government prohibits from being greater than 1 percent of GDP of regions in 2014. Originally Spain’s tax on total bank account deposits was not intended to raise a dollar of direct revenue. Instead, the tax was created in 2013 as a legal mechanism to restrict the expansion of local deposit taxes. For example, at a required 0 percent rate, the tax negated regional bank account deposit taxes, like the 0.5 percent tax in Catalan. Instead of directly raising revenues, the tax set a uniform standard for Spain’s 17 regional governments and helped to stabilize Spanish markets and stimulate growth. Levying a new tax on bank accounts will only discourage investment and hamper Spain’s recent economic growth. The best way to continue regional government is to stick with the policies that have guided Spain through its recovery thus far. Since emerging from the recession in the third quarter of 2013, Spain’s GDP continues to grow at rate of 0.4 percent. This growth has improved Spain’s deficit to GDP ratio. 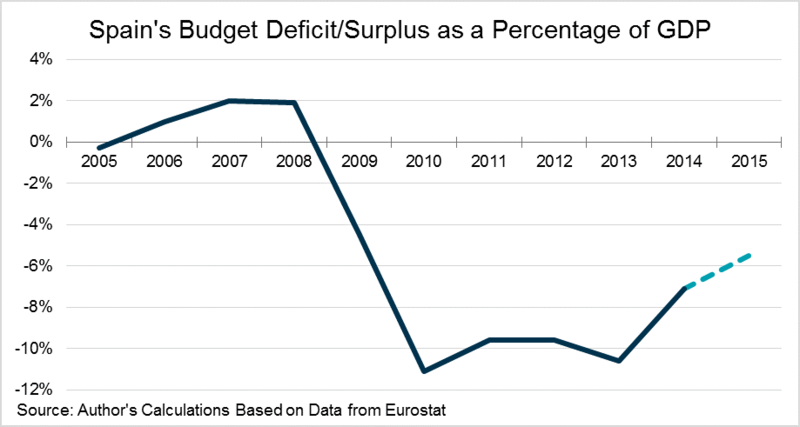 Since 2010 Spain’s deficit as a percentage of GDP has risen from -11.1 percent to -7.1 percent last year. Furthermore, the government’s deficit target for 2015 is now 5.5 percent, up from its original 5.8 percent goal. 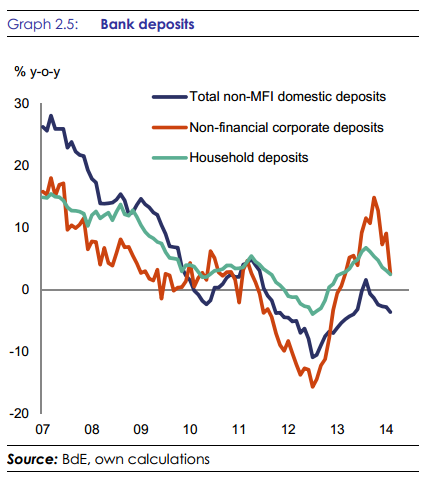 Contributing to this recent success, Spain’s domestic banks deposits have also increased. In February of 2014 household and non-financial corporate deposits grew at a rate of 2.5 percent year-over-year, which is a marked improvement since the recession (see chart below). This growth has allowed Spanish banks to rely less on loans from the Eurosystem, lowering the cost of funding for these Spanish banks. Finally as a capstone to Spains’ recovery, in January of 2014 Spain exited the European Commission’s Financial Assistance Programme after experiencing a trend of economic improvement. If Spain wants to improve the debt to GDP ratio of its regional governments it should push for more spending cuts or find revenue streams other than taxes on investment. In the end, instead of helping regional governments, an increase in the deposit tax discourages investment. The bank tax harms a sensitive banking sector that is only in the first stages of recovery.